Buying locally automatically retains money within the local economy, thus protecting, in the most sustainable way possible, the unique flavour and character of Norfolk. The directors of Buy Local Norfolk would like to offer huge thanks to Dean Arnett for taking the time to film and produce this for us. Buy Local Norfolk provides a unique accreditation process for genuinely local businesses in Norfolk. Having gained this accreditation, our member businesses are authorised to display the Buy Local Norfolk logo, identifying themselves to the growing number of businesses and consumers to whom buying local products and services is important. With a growing network of member businesses, the Buy Local Norfolk logo has become a recognisable mark throughout Norfolk. The Buy Local ‘brand’ enables procurement managers, buyers, customers and visitors to make an informed choice about directly investing in the Norfolk economy. 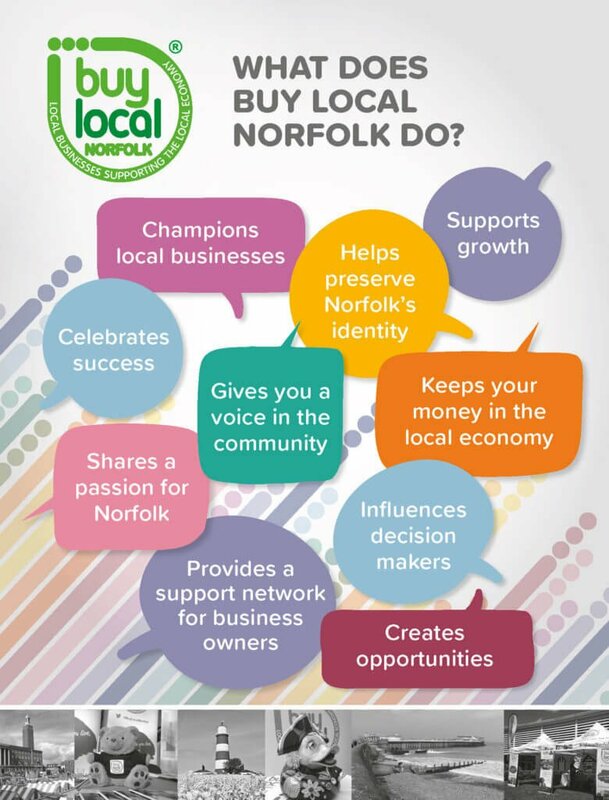 Why become a member of Buy Local Norfolk? Free to attend monthly networking meetings: really friendly, informal and mutually beneficial. Meet like-minded, supportive and well-connected members with businesses of all shapes and sizes who can understand and relate to you and your business. A problem shared…! Free badge, door sticker and certificate: to proudly display your support for local businesses. As part of our long-term campaign promoting the huge benefits of using locally owned businesses with local authority leaders, MPs and MEPs, we’re developing mutually beneficial relationships with Norwich City Council, Easton and Otley College and Norse to name but a few. Buy Local Norfolk is supported by Norfolk MPs Chloe Smith, Clive Lewis, Keith Simpson, Elizabeth Truss, George Freeman and Brandon Lewis. You’ll find our logo on many of their websites.